Beit Shemesh set to receive new round of mayoral elections, appeal to be rejected by High Court for Justice, according to report. On Wednesday night, the High Court for Justice is set to reject the appeal filed by mayor Moshe Abutbul (Shas) against the Jerusalem District Court's ruling to hold new mayoral elections in Beit Shemesh, according to Channel 10. If this scenario materializes, Interior Minister Gidon Saar will then have 30 days to submit a date for the new elections. Hearings first began in the Beit Shemesh municipal election case in December. Abutbul and other party members have been accused of a large-scale fraud operation, after multiple complaints were filed by hundreds of residents of the city. The city has been bitterly divided for years between its hareidi-religious population and its Zionist population, which consists of national-religious, traditional, and secular people. The outcome of elections was viewed by many city residents as vital to determining the city's future. On election day, police arrested several hareidi men in possession of an estimated 200 fake ID cards, which they had apparently been using to cast fraudulent votes. In addition, several residents said after the elections that when they had come to vote, they had been wrongly told that they had already voted. The revelations triggered an outcry among local residents - in particular supporters of Abutbul's rival, Eli Cohen, who lost out to the hareidi incumbent by a mere 956 votes - who called for an immediate rerun of the election, accusing Abutbul and his supporters of conducting a large-scale voting scam. 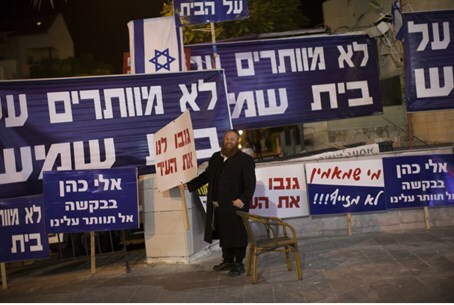 Cohen's supporters claim that Abutbul has been making administrative decisions that favor the hareidi-religous community's needs. Hareidi MKs cried foul at the decision to establish new elections in January and filed an appeal, claiming the decision was made out of anti-hareidi discrimination. However, the decision to hold new elections had already gained both public and political support, with Attorney General Yehuda Weinstein personally voicing his opinion that an appeal should be rejected outright.